This genus is accepted, and its native range is SE. Brazil, Tropical & S. Africa. Ligule scarious; leaf laminas linear. 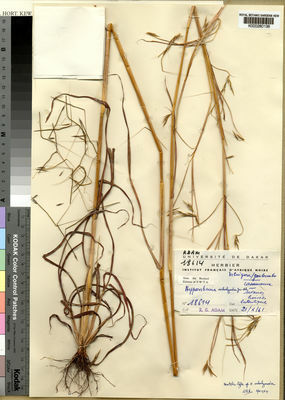 Inflorescence composed of paired (rarely solitary) racemes long-exserted from narrow spatheoles and gathered into a false panicle; racemes slender, with up to 10 homogamous spikelet-pairs (only 1 in the Flora Zambesiaca area); raceme-bases filiform, unequal, rarely deflexed; internodes and pedicels linear. Sessile spikelet ± terete; callus narrowly obtuse to pungent, applied obliquely to the apex of the internode with its tip free; inferior glume coriaceous, rounded on the back and sides, becoming dark brown; superior glume nearly always awned; inferior floret reduced to a hyaline lemma; superior lemma stipitiform, bilobed, passing between the lobes into an awn with ± hirsute column. Pedicelled spikelet male or barren, narrowly lanceolate, olive-green tinged with brown, the callus well developed. Annual (3), or perennial (3). 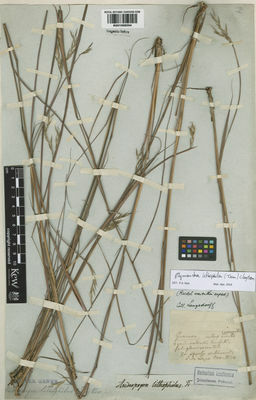 Culms erect; slender (1/1); 30-162.8-260 cm long. Ligule an eciliate membrane (4), or a ciliolate membrane (3). Leaf-blade base without a false petiole, or with a brief petiole-like connection to sheath (1). Leaf-blades stiff (3), or firm (3). Leaf-blade midrib widened (1/1). Synflorescence compound; scanty (4), or paniculate (2). Inflorescence composed of racemes; terminal and axillary; subtended by a spatheole; exserted, or embraced at base by subtending leaf (1). Spatheole linear; scarious. Racemes single (1), or paired (5); bearing few fertile spikelets (5), or many spikelets (1); bearing 1 fertile spikelets on each (3), or 2-3 fertile spikelets on each (2), or 4-5 fertile spikelets on each (1), or 6-8 fertile spikelets on each (2), or 9 fertile spikelets on each (1). Rhachis fragile at the nodes. Spikelet packing crowded (2), or contiguous (2), or lax (2). 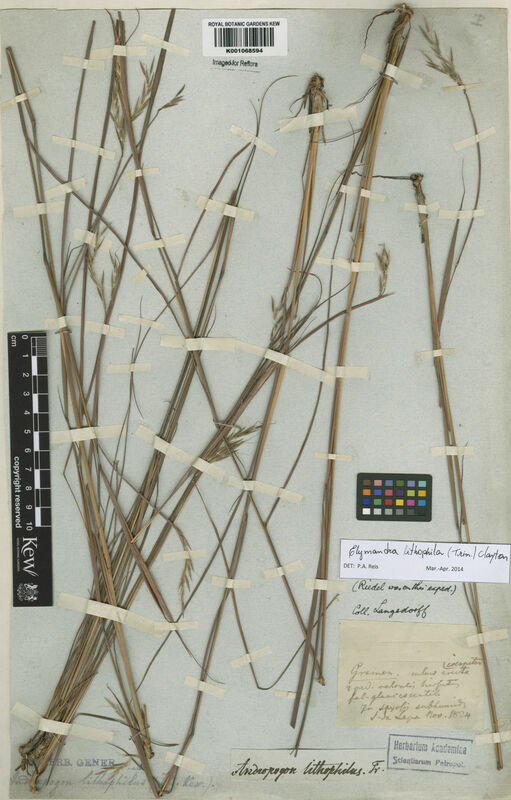 Rhachis internodes filiform. Rhachis internode tip oblique. Raceme-bases brief (1), or filiform (5); unequal (the longer measured) (5/5). Spikelets in pairs. Fertile spikelets sessile; 1 in the cluster. 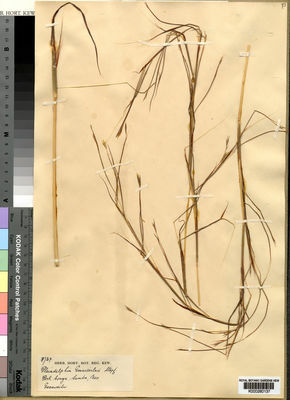 Companion sterile spikelets pedicelled; 1 in the cluster. Pedicels filiform. Basal sterile spikelets well-developed; persistent (5), or separately deciduous (1). Companion sterile spikelets well-developed; separately deciduous. Companion sterile spikelet callus oblong (4), or cuneate (1), or linear (1). Companion sterile spikelet glumes muticous (1/1), or mucronate (1/1). Spikelets comprising 1 basal sterile florets; 1 fertile florets; without rhachilla extension. Spikelets elliptic; subterete; 5.81-9.684-16 mm long; falling entire; deciduous with accessory branch structures. Spikelet callus linear; pubescent (2), or bearded (4); base obtuse (1), or pungent (5); attached obliquely. Basal sterile spikelets well-developed; persistent (5), or separately deciduous (1). 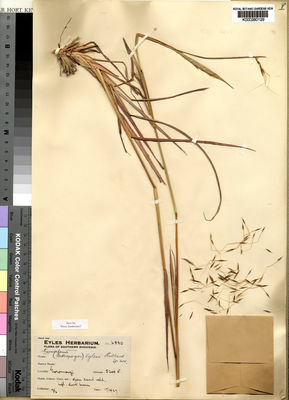 Companion sterile spikelets well-developed; separately deciduous. Companion sterile spikelet callus oblong (4), or cuneate (1), or linear (1). 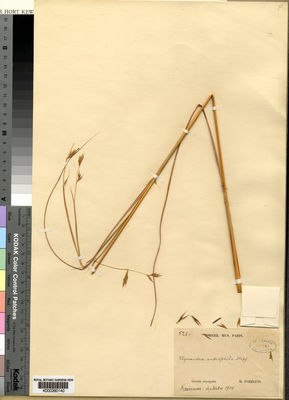 Companion sterile spikelet glumes muticous (1/1), or mucronate (1/1). Spikelets comprising 1 basal sterile florets; 1 fertile florets; without rhachilla extension. Spikelets elliptic; subterete; 5.81-9.684-16 mm long; falling entire; deciduous with accessory branch structures. Spikelet callus linear; pubescent (2), or bearded (4); base obtuse (1), or pungent (5); attached obliquely. Glumes exceeding apex of florets; firmer than fertile lemma. Lower glume elliptic; chartaceous; without keels; 7 -veined (2/2). Lower glume surface pubescent (2), or pilose (2), or villous (2). Lower glume apex truncate. Upper glume lanceolate; chartaceous; without keels; 3 -veined (2/2). Upper glume surface pilose. Upper glume apex acute (5), or acuminate (1); muticous (1), or awned; 1 -awned. Basal sterile florets barren; without significant palea. Lemma of lower sterile floret oblong; hyaline; 2 -veined. Fertile lemma linear; hyaline; without keel. Lemma margins eciliate (5), or ciliate (1). Lemma apex dentate (2), or lobed (4); 2 -fid; incised 0.2-0.3583-0.5 of lemma length; awned; 1 -awned. Principal lemma awn from a sinus; geniculate. Column of lemma awn hispidulous (2), or puberulous (1), or pubescent (2), or hirtellous (1). Palea absent or minute. Africa, or South America (1). Pedicelled spikelet ♂ or barren, narrowly lanceolate, olive green tinted with brown, the callus well developed. Clayton in Kew Bull. 20: 287 (1966). in Prain, F.T.A. 9: 407 (1919).